Finalists for the award represent a selection of the best timepieces of the year as chosen through a two-step voting process by TimeZone moderators. The winner is chosen exclusively by the TimeZone community, the world’s largest community of wristwatch enthusiasts. Voting commenced on February 11, 2012 and concluded at noon GMT on February 28, 2012. The TimeZone community selected the Grönefeld One Hertz as this year’s winner. To see how the community voted, please visit the 2011 TimeZone Watch of the Year Forum. 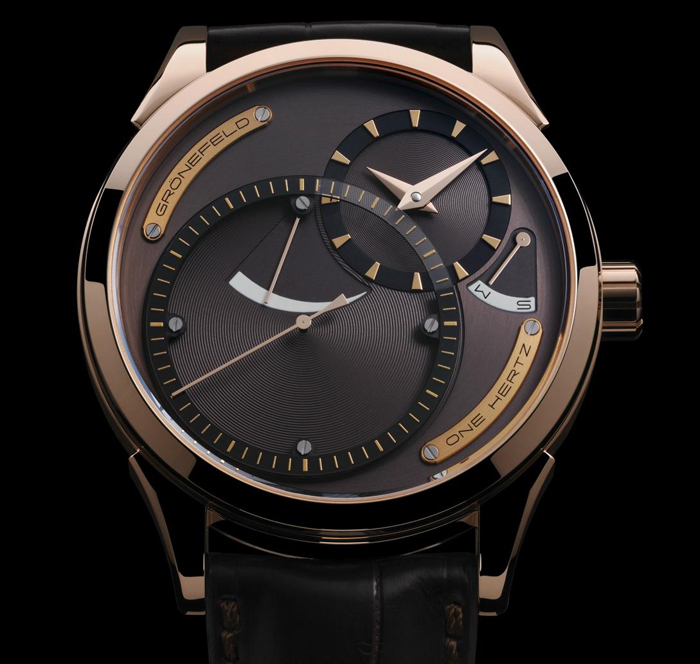 Dutch watchmakers Tim and Bart Gronefeld presented in 2011 the “One Hertz”, the world’s first and only production wristwatch with independent dead seconds (secondes morte in French). The One Hertz features Grönefeld own proprietary movement and indicates hours and minutes on a sub-dial at 2 o’clock; large sub-dial for the dead seconds; power reserve indicator at 12 o’clock; and an innovative setting-winding indicator at 3 o’clock. Setting-winding is ergonomically selected by pushing the crown in rather than pulling it out. Dead seconds – where the second hand advances in full steps of one second instead of an apparently smooth sweeping action. The Grönefeld “One Hertz” is unique among wristwatches in that its dead seconds are powered by a secondary gear train independent of the gear train for the hour and minute indications. indicator, setting-winding indicator, Grönefeld logo and model name on individual screwed down nameplates. Movement: Calibre: G-02, mechanical hand winding, independent dead seconds, power reserve Indicator and setting indicator. Dead seconds mechanism: independent mechanism, cam with 30 teeth on the going gear train on the second’s wheel, escape wheel on the seconds wheel of the independent gear train, double lever with jewelled pallets.